Mental stuff is hard to comprehend! Finding mental strength – even harder!!!! And it’s always easier said than done. How does the mind of a ‘never say die’ athlete work? What prepares an athlete mentally to go and run a 100 miler in the most brutal of conditions? What makes a mountaineer yearn for the thin air leading to the highest peaks (knowing fully that they may not see another day)? Does the thought of giving up ever cross their minds? And if it does – what does she do to push that thought away? Because unfortunately for us, all we see is the glory. We don’t and we can’t read her mind battles! So here I am, asking myself about what is being mentally tough? How can I train myself for it? Does it mean I won’t ever give up in the thick of action? What does being mentally tough mean to you? How do you strategize for the mental game? I really don’t complicate my thoughts too much by trying to strategize..I firmly believe that since time keeps moving, whatever you have to go through, it will end after a definite time… So I don’t think much about an event, because I know that I have to do it, I know that I have to give my best, and I know that I don’t have any other choice but to just keep moving and the journey will end for sure…and I always set targets that are achievable, and that keeps my mind and body in a balanced state..
How do you manage to withstand the most grueling circumstance and win? I believe in God, and I believe in the fact that there’s lot of energy in space that can be tapped.. So when I really feel down and out, I seek strength and energy from Him, and that keeps me going… Also, in such circumstances, I may take a few minutes of rest to rejuvenate and recover.. I also tap my emotional energy, by thinking of my target and achieving it, which gives me that much needed push to regain my composure and strength.. So far, what blew you away mentally? What is the hardest thing you’ve done physically? Honestly it’s very difficult to answer that, especially since I’ve been in this Ultra game for just over an year, and haven’t run many Ultras to compare… Probably it was at the 24 Hours Challenge Bangalore Ultra in Nov 2015… The race had a one km loop from the eleventh hour onwards, which was a badly damaged and broken road with lots of pebbles, gravel and stones and to run on it, especially in the poorly lit conditions, would have resulted in a bad fall and a possible resultant DNF.. On the other hand I couldn’t walk due to a bad painful blister, which would’ve pained less if I could run, but then I couldn’t risk a fall… So throughout the night, I kept walking, and I couldn’t walk slower because the pace was kept faster by Meenal (my fellow runner) so that we cover a good distance, but then it was very very painful and tough for me.. In fact at about 3 AM I told Meenal to leave me, so that I could walk slower, and she could continue at her faster pace, otherwise I was inhibiting her… And when there was just one hour to go for the finish time, I disregarded the risk of falling and started running, which was a huge relief for me, as it pained lesser.. It was only when I finished the race, did I open my shoes for the first time in more than 24 hours, and the big red ugly blister which came out from under my socks, took many days to disappear. Jogi Sir (as known to many) is a serving Commodore in the Indian Navy, and has been in commissioned service for more than 29 years. He ran his first Half Marathon at SCMM 2013 and his second HM was 11 months later at ADHM 2013. Before he ran his Full Marathon at SCMM 2015 with a timing of 4:14, he had already run a 50 kms at the Bhatti Lakes Ultra in 2014 with a timing of 5:40. 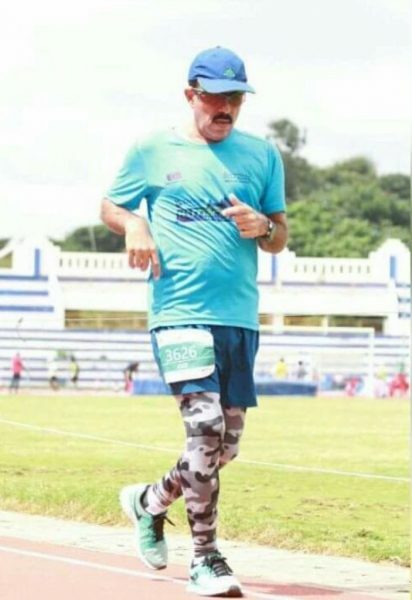 He thereafter shifted focus to Ultras, by running at the SPBM Benguluru 12 Hours Stadium Run 2015 (94 kms), at the Bangalore Ultra 24 Hours Challenge 2015 (145 kms) and at the SPBM Benguluru 36 Hours Stadium Run 2016 (210 kms). His PB in Half and Full Marathon stands at 1:47 and 4:01 respectively. He, alongwith Ms Meenal Kotak, also ran 42.2 kms for 10 consecutive days in Mar/Apr 16 at the inaugural event in their Miles into Smiles Initiative, and also ran from Delhi to Jaipur in Jul 16 as part of the Great India Run. This piece is inspired by an article done by the Greatist.com (http://greatist.com/fitness/mental-training-tips-professional-athletes). It was only apt that I reached out to some of our local heroes! What’s your take on being mentally tough? How do you overcome the circumstances the outside of you? What has helped you get mentally stronger? Share in the comments below! Really inspiring story. I have walked and jogged through 7 half marathons so far in the last 5 years but have not been able to get the courage to do a full marathon. Was just wondering as to how do i change the gear.